The wheel is too difficult to treadle. Check your drive band tension—it should have some give in it. If it is too tight, then try loosening it. Oiling your wheel can make a huge difference, especially if it is new. When I put my foot down, the wheel slides across the floor. If you are spinning to the right, make sure the footman is in the one o’clock position before you push down on the treadle. If you are spinning to the left, make sure the footman is in the eleven o’clock position. If you treadle when the footman is at the twelve o’clock position, the wheel will lock and you will push it across the floor. Beginning spinners often think that the surface of the floor is too smooth, causing the wheel to slide. When I push down on the treadle, the wheel flips back and forth. When you are just starting to spin, you might lift either your heel or toe from the treadle, causing the wheel to become unbalanced and flip back and forth. If I tighten the scotch brake enough for my yarn to pull on, the wheel does not turn. Try letting off a bit of the brake band tension. If the wheel turns properly and the yarn is pulling in correctly that will solve the problem. If the wheel turns, but the yarn now won’t pull on at the speed you need, tighten the tension on the drive band just enough so that the yarn pulls on at the proper speed. The yarn keeps getting tangled between the flyer and the bobbin. This happens because your treadling is not even. Just break it off, hook it up, and start again. Another reason for this may be that the bobbin has become too full, causing the yarn to spill over the edge of the bobbin, and tangle around the shaft. I have to hold on to the yarn very tightly. Try releasing some of the tension on the brake band if it is a single-drive wheel, and off both bands if it is a double-drive wheel. Ensure that you place it on a middle-sized whorl; too big a whorl causes the yarn to pull in very quickly. I feel like I am pushing the yarn into the wheel. Tighten the tension on the scotch brake if you use a single-drive wheel, or both the bobbin and the flyer if your wheel is a double-drive wheel. Check which whorl you are on; if the whorl is too small, it puts a lot of twist in the yarn. Sometimes just the friction of the high-twist yarn is enough to stop the wheel from pulling it on to the bobbin. In this case, break it off and start again. Make sure that your bobbin is not full; this makes it hard to draw on any more yarn. Fourth, check to see whether the yarn is caught around a hook, and that there is nothing to stop it from feeding on to the wheel. Finally, check that the bobbin is moving smoothly on the flyer. 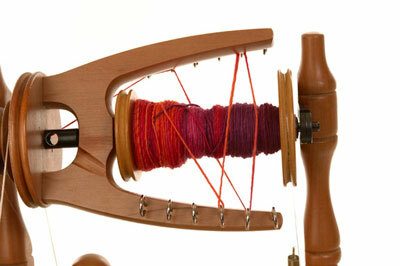 Bobbins can swell with changes in humidity, and they can also be made incorrectly. I cannot pull out the fiber. Turn the fiber around and try spinning it from the other end. Also, did you get twist in the fiber? Twist is just like glue, because it is what makes the fibers cling together. Sometimes, no matter how carefully you move your fingers, the twist gets past them. When this happens, the fiber “glues” shut. My yarn seems to have a nice twist but when I pull it back, it keeps breaking. Have you left the brake on? This puts enough pressure on a bobbin that a soft yarn will break when you pull it off. I can fill the bobbin up about halfway, but then it does not feed on any more yarnThe fuller the bobbin, the closer in size it becomes to the flyer, and the less the yarn pulls on. In this case, gently tighten the tension on the brake or the tension on the double-drive band as the bobbin fills up to keep the wheel consistently pulling on the yarn. I have lost my end. Roll the bobbin around a few times. Your end is usually under the last hook that it was over. You can try a piece of tape to see if it pulls up the loose end; this solution works about half of the time. If not, then pull the most likely end and try to pull enough yarn for a new leader and start again. My yarn seems to be full of lumps and bumps. Consistent yarn comes with practice; it grows out of the rhythm that your body learns over time. Check to see whether you are pulling out too much fiber.